Imagine the interesting discussions around the breakfast table when the husband studies role of European Union politics in Sweden and his wife gender equality in higher education. 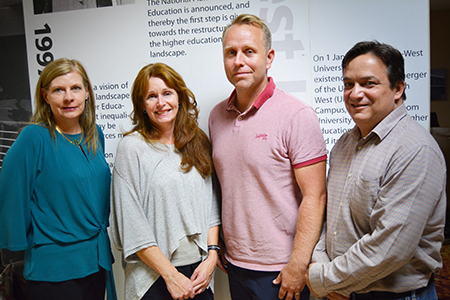 Esteemed political scientists, Prof Daniel and Dr Charlotte Silander from Linnaeus University in Sweden (LNU), recently visited the North-West University’s (NWU’s) campus in Vanderbijlpark. Their visit took place under the auspices of the Linnaeus Palme Exchange programme and the memorandum of agreement that was signed between the NWU and the LNU. This initiative is coordinated by Prof Herman van der Elst from the School of Political Sciences for the NWU and by Dr Charlotte Silander for the LNU. During their time on campus Prof Daniel, director of European Studies and Dr Charlotte a senior lecturer, presented a series of lectures aimed specifically at political science students. Prof Daniel presented on the mechanisms and contemporary challenges of the European Union (EU), taking students through the union’s history. He also discussed EU politics and its effects on Sweden and the rest of Europe. He said that the EU and its member countries no longer sees the African continent as needing help, but rather considers it as a present partner than a future one. Dr Charlotte conducted a session with students on gender equality in higher education. She also explained her involvement in various projects addressing this issue. During their visit the couple also met with Prof Linda du Plessis, the deputy vice-chancellor for planning and operations on the campus in Vanderbijlpark. She said international collaboration such as with the LNU is essential for the future of sustainable and quality higher education. As part of the Linnaeus Palme Exchange programme, two Swedish exchange students are currently registered for political science honours modules at the NWU. Two NWU students are also enrolled for political science modules at LNU. From left are Prof Linda du Plessis, Dr Charlotte Silander, Prof Daniel Silander and Prof Herman van der Elst.